When I look at 7 years of the Yale Blog, I look at the reliability ratings, the product comparisons and the commentary on new trends in our industry. I thought I would write an article on the niceties or the non crucial, yet enjoyable products. As we have arisen (somewhat) out of the recession, you have seen more innovative products like speed ovens, microwave drawers and even Pandora playing wall ovens. Companies like Bosch Benchmark, GE, Wolf and Sub-Zero have focused on building their products better. The following companies have created new categories of very different products. After you have finished designing your kitchen with appliances and lighting. Have a look at a few very different items, like Wine Dispensers, Humidors and Coffee Systems. 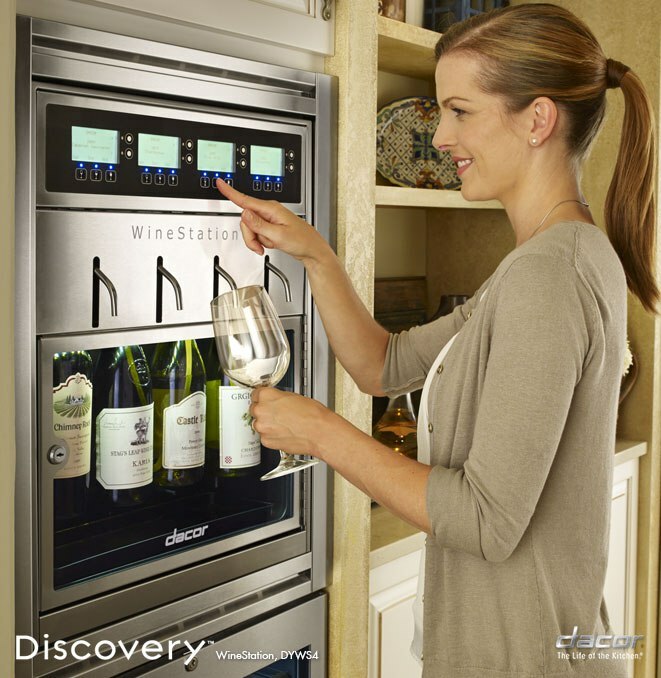 The Discovery WineStation® is the first automated, temperature controlled, four-bottle wine dispensing and preservation system for the home. You can choose the right wine and just the right amount a taste, a half glass or a full glass with the touch of a finger. 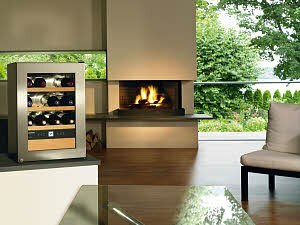 I love this in a kitchen or a wine room. Discovery WineStation® maintains the freshness of your favorite wine selections for up to 60 days without the loss of flavor or natural aroma. This product is great for entertaining and gives you the ability to keep your wine fresh if you don’t drink the full bottle. The built in look is a perfect match to install over a 24” wine cooler. This is a great addition to a bar or kitchen. 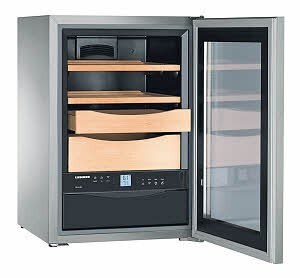 Liebherr is a popular European fridge company, but besides fridges they make an amazing little built in humidor. For all of you cigar lovers out there, this is a great way to show off your stogie collection, not to mention keeping them fresh. You also keep them out of your refrigerators, so the odors will not cross contaminate the other items in your refrigerator (cigar owners know what I mean). This model has LED lighting, Spanish cedar wood shelve, Digital temperature and humidity displays. Like the Humidor above, this little gem fits in a small wall cabinet or freestanding. Most people don’t have the need or space for a 46 bottle under counter wine unit. I have one and at the most I’ve stored 8 wines it. This is good for storing wines at a drinking temperature, so they are ready for the weekly dinner party or after a long day at work. With UV protected glass door, 3 Wooden Grid Shelves, LED Lights and Touch Control System with Digital Temperature Display, you can be assured your wine will taste as intended. 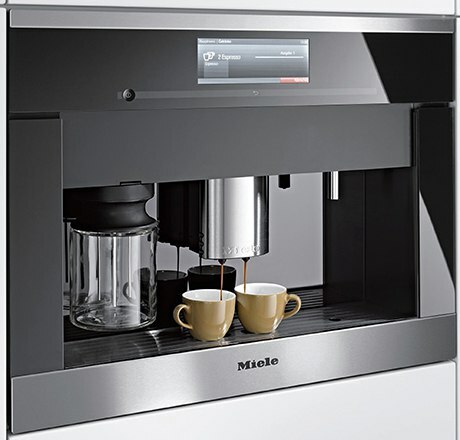 The plumbed Miele coffee system has been a popular built-in for many years due to it’s elegant integrated look, plus it makes an amazing cup of coffee. This particular model can be plumbed in from a filtered waterline. With a bean grinder and whole bean container built in, you can make multiple cups of coffee or lattes on the fly without any extra work. Speaking of lattes, there is a built in milk reservoir for instant milk and froth. If you’re into the flavored coffee beans,Miele has a container for pre-ground coffee that you can use at the push of a button. As I said before none of these products are really necessary, but they make life a bit more enjoyable. It is a good consideration for people who enjoy really good coffee, wine and need a place to properly store cigars without offending the other members of your family. Get the Yale Appliance Buyers Guide with features, specs and inside tips to all the brands. Well over 80,000 people have read a Yale Guide.